"A book that you wake in the middle of the night craving to get back to . . . . Timeless, charming, a pure pleasure to read . . . . The Thirteeth Tale is a book to savor a dozen times." "A wholly original work told in the vein of all the best gothic classics. Lovers of books about book lovers will be enthralled." 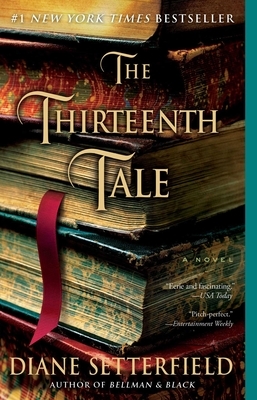 "The shared literary landscape that The Thirteenth Tale re-creates with lush precision takes us back to a time when reading could seem more compelling than life." "A spellbinding story that grabs the reader from the opening pages." "Setterfield proves a mistress of the craft of storytelling, and her musings about the pleasures of reading are most beguiling." "Readers will feel the magnetic pull of this paean to words, books and the magical power of story." "This will without a doubt be one of the best books published this year." "Readers will be mesmerized by this story-within-a-story tinged with the eeriness of Rebecca and the willfulness of Jane Eyre. The author . . . . leaves no strand untucked at the surprising and satisfying conclusion." "Setterfield is remarkably gifted, and the book is a page-turner. Readers should heed one warning: Prepare to be so captivated by the story that you cannot put it down. Not even for a cuppa tea." "A novel for book lovers." "A novel brimming with atmosphere and labyrinthine plotting that recalls the gothic-like chillers by Daphne du Maurier and Joyce Carol Oates, spiced with flavors reminiscent of Jane Eyre and Wuthering Heights. The language is rich, the elements intriguing." "A compelling and emotional mystery about family secrets and the magic of books and storytelling, and it captures you right from the very first page." "Cleverly plotted, beautifully written . . . . A remarkable first novel, a book about the joy of books, a riveting multi-layered mystery that twists and turns, and weaves a quite magical spell."